31: We were all lapsing into the doldrums so I made us suit up and go down to the nature reserve. A very wet and dreary day can still be beautiful. 32: My first month of the Sky Blanket project in review; starting off with the night sky on New Year's Eve and ending with rain, plenty of grey skies and blue days in between, with one or two gorgeous sunrises and sunsets. 33: With the help of the local school liaison police officer, we ran an Internet Safety Forum after school for parents, this was how many turned up. I give up. 34: Sleeping child photo? It must be Wednesday! 35: I've finished my first crocheted blanket for charity; this is going to an organisation which sends blankets to chemotherapy patients. 36: We nipped over to my sister's house after school for a catch-up, and the boys ended up making a rather impressive den. 37: Today was a foul day so we popped over to Mr. TBaM's office to play table tennis, table football and a game of pool or two. Well that makes our parents turnout look really good for the ones I've attended! Must be soul destroying. My OH's niece is one of Monkey's Year 1/2 teachers and I know how much work they put into things for only 9 out of 90 parents to turn up 🙁 I love the look of your blanket and that first photo is stunning. We have over 500 children in the school with around 330 families, it is absolutely shocking that none of them thought they needed to attend. Nobody from over 330 families?! I thought the number of chairs represented the turnout!! Oh dear, that empty hall isn't good! Love that picture in the nature reserve and the expression on The Boy's face when he's playing table football. Mr TBaM's a office is a bit of a mens den!!! What a shame about the internet safety session after school. can't believe none turned up. That must have been very disappointing to have no one turn up. 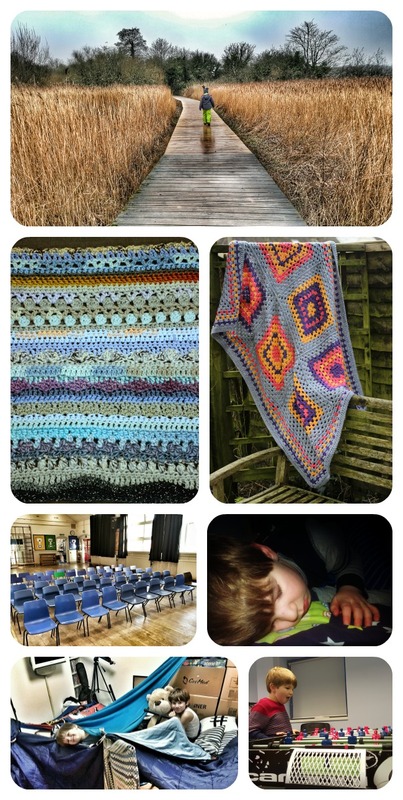 Your sky blanket is coming along beautifully and I love the one you did for charity too. That first picture is truly stunning, love the reflection in the puddle. Cannot believe no one turned up to the internet safety thing – did they have to book first? Loving the blankets. Both look great. Our school are running a similar internet safety talk this week, but I can't go as it's straight after school. Bit poor that noone at all turned up. The nature reserve shot is fantastic. I wish we had more like that round here. They're very much a muddy walk in a wood and that's it. More amazing crochet creations! And I love that photograph at the top, saw it on social media during the week I think. Just stunning. Your photo from the nature reserve is gorgeous! I am impressed by the boys' den as well, looks like fun. Argh sorry to see how many parents turned up for the Internet safety forum. I bet 80% could do with learning about it too. Love the blanket, that's beautiful. Your blanket looks beautiful, I cant wait to see it keep growing. I'm beginning to love going outdoors in the rain, if I didn't I would never leave the house! My mum runs those at her school as well, same turn out as you. 🙁 I just don't understand it. I would like to be in TBaM's office, that sounds like a whole lotta fun! Have a great new week. A lot of parents truly believe their child is safe on the internet, it wont happen to them until it does! Love the nature reserve picture, but wonder how high all the plants at the side grow to when they are back in growing season if that is them died back. That looks like a great office to work in!! My boys used to love making dens. Lovely photo at the nature reserve. That first picture is just beautiful, no wonder you wanted to get out and enjoy the skies.